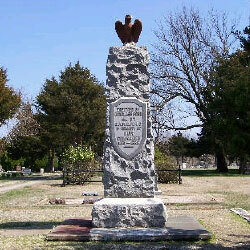 Description: A granite monument is erected in the Cemetery. 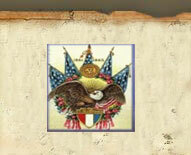 The inscription reads: "To The Veterans Of Augusta ~ Who Served Our Country ~ They Gave Their Today ~ For Our Tomorrow." 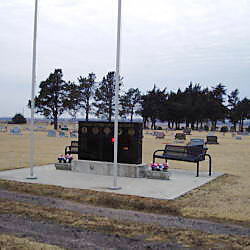 Additional plaques are inscribed: "Dedicated July 3, 1975", "Monument Dedication - November 17, 1994", and "Modification Dedication - May 17, 1996". 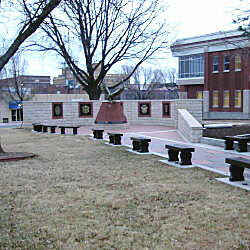 The back side of the monument has plaques mounted listing Somalia, Kuwait, Panama, Haiti, El Salvador, Viet Nam, W.W. II, W.W. I and Civil War. Description: The main inscription reads: "Erected By ~ Douglass Post ~ No. 97 ~ G.A.R. 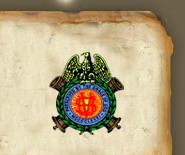 & W.R.C. 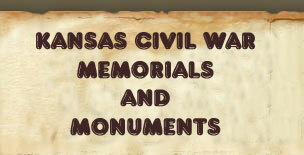 ~ In Memory Of ~ Our ~ Comrades ~ 1861 - 1865". The base is inscribed "1914". 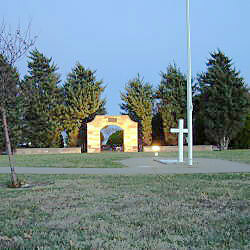 Description: A memorial plaza with a flagpole, concrete cross and stone wall and arch is in the center of the cemetery. The cross is engraved "Lest We Forget"
A bronze plaque centered on the top of the arch is inscribed: "To God ~ And ~ Those Who Served ~ Our Country". 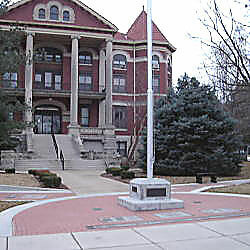 Description: A flagpole is centrally located in front of the court house. A plaque on the front is inscribed: "This Staff Dedicated To The ~ Veterans Of All United States ~ Wars Who Valorously Defended ~ The Flag It Bears". A plaque on the reverse reads: "Stars & Stripes Waving Here ~ Perpetually Provided By ~ Fred Priestley Post 1174 ~ Veterans Of Foreign Wars"
To the east of the flagpole is a memorial plaza with a centrally located bronze eagle. The surrounding stone walls have the insignias of the modern military services. 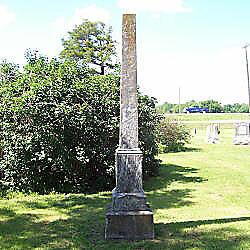 Description: This granite marker has a GAR badge incised on the upper column. The main inscription reads: "To The ~ Memory ~ Of ~ Our Heroic ~ Dead ~ 1861 - 1865". The back is engraved: "Erected By ~ Leon Circle ~ No 17 ~ Ladies Of The ~ G.A.R." 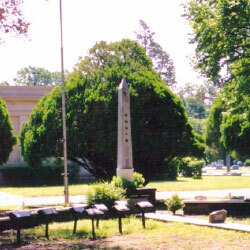 Description: A black granite marker with two adjoining flagpoles is located on the east end of the cemetery. The inscription reads: "In Memory of Those Who Proudly Served" Below the inscription are the inscribed medallions of the five modern branches of the service and names of those who served.